Home / News / Regal Robot debuts at Star Wars Celebration! Regal Robot debuts at Star Wars Celebration! 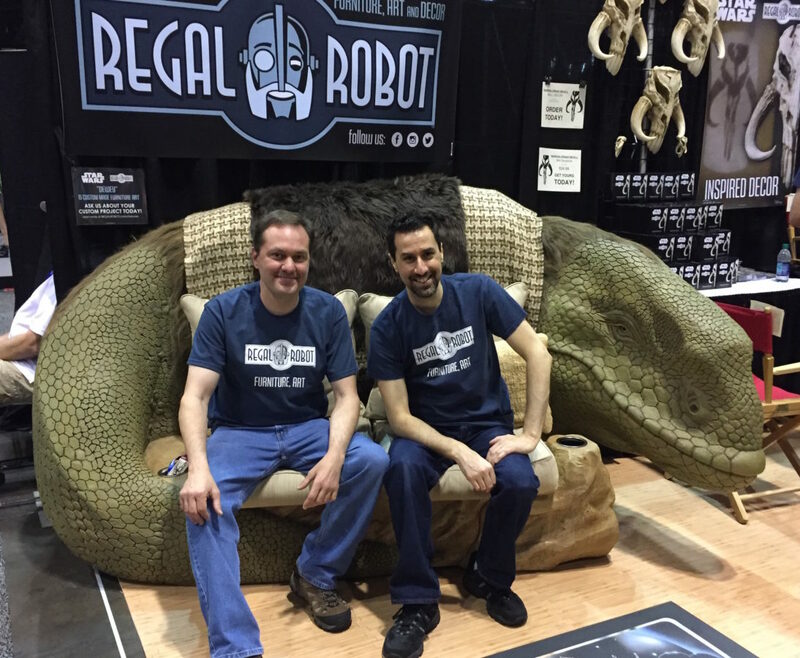 Regal Robot debuts at Star Wars Celebration Orlando! Regal Robot made our big debut at Star Wars Celebration Orlando last week. 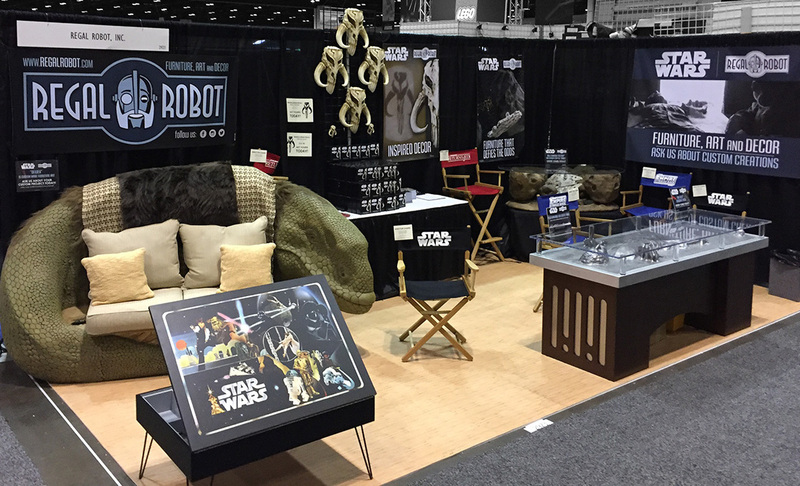 Our booth featured a number of our official Star Wars™ furniture and decor products, and we met thousands of wonderful fans at the show. We also debuted our first official Star Wars custom furniture piece from our Regal Robot Custom Studio! Say hello to “Dewey” (as we nicknamed him), the Dewback Loveseat! This functional art piece made a great photo op for fans, cosplayers and even made a comfy place to sit and do interviews with the various media outlets that came by the booth. 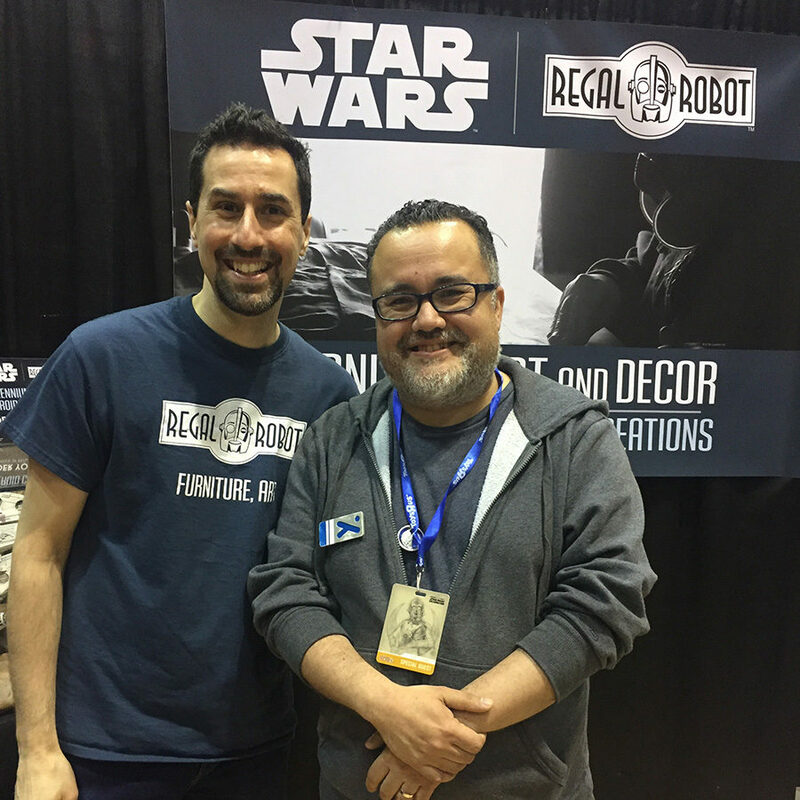 Regal Robot lead designers, Richard Riley and Tom Spina at Star Wars Celebration. In addition to the booth, our company founder, Tom Spina, was a special guest of the show, and featured in a number of panels as well, sharing the stage with Lucasfilm creative executive, Pablo Hidalgo for another in their string of legendary “Behind the Scenes at the Cantina” panels, where they not only showed countless extraordinary behind the scenes images, but also rare video. They even officially named two previously unnamed characters from the 1977 film after members of the audience! Tom was even interviewed on stage with the Star Wars Show Live as well, so click through and watch the video to learn more about our new company and the whirlwind of activity that was Star Wars Celebration for our founder and our crew! If you were one of the many fans who stopped by our booth to say, “hi!” or take a pic with Dewey, please be sure to post your pics from the show and let us know by tagging us at @RegalRobot on Twitter, Facebook or Instagram. Our crew had an amazing time at the show, and the energy of Star Wars fans is second to none. We’re so pleased that we were able to share our art, furniture and decor with so many great people throughout this one of a kind event, and are anxiously looking forward to the next Celebration. We hope to see you there!